We are more than pancake professionals. All six of our restaurant locations are committed to supporting local groups, neighboring schools, youth-sports teams, and non-profit organizations. One of the ways we do this is by hosting our Breakfast For Dinner fundraisers. When you partner with Chip’s we will send you a digital flyer to spread the word and a pdf file of tickets for you to sell. Chip’s provides the breakfast (2 plain pancakes, 2 bacon or sausage, 2 eggs any style, coffee/tea or a soft drink) along with three seating’s of 60 (180 People Total). You provide a greeter to verify the guest has a ticket and the correct seating time as well as collect cash for ticket sales. In the end, you receive 100% of your groups ticket sales! Talk about an eggcelent profit. 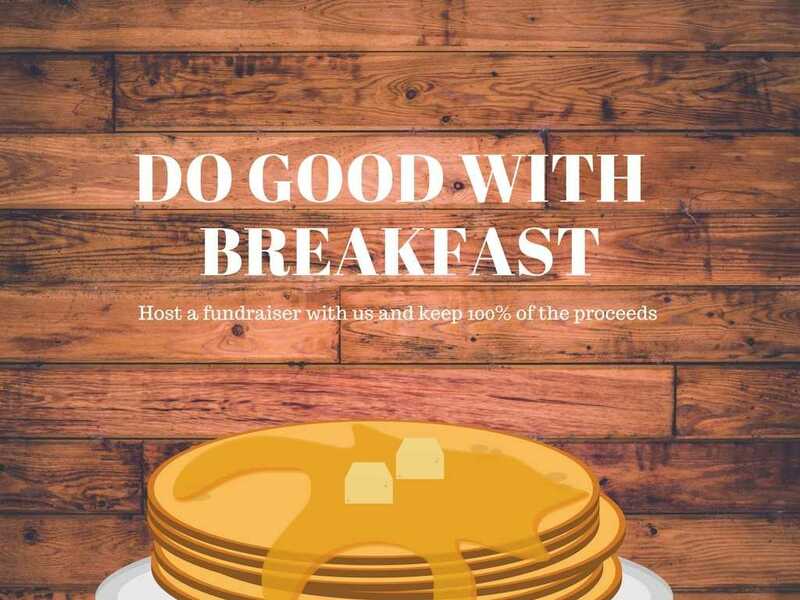 Breakfast for dinner fundraisers are available Monday-Wednesday and are unavailable for Holidays. Before you submit an application please note that submitting an application does not guarantee approval and Chip’s must confirm the date and time of the fundraiser. Sound Good? Let’s get started! Chip’s works with k-12 schools, youth groups, university groups, and non-profit organizations. 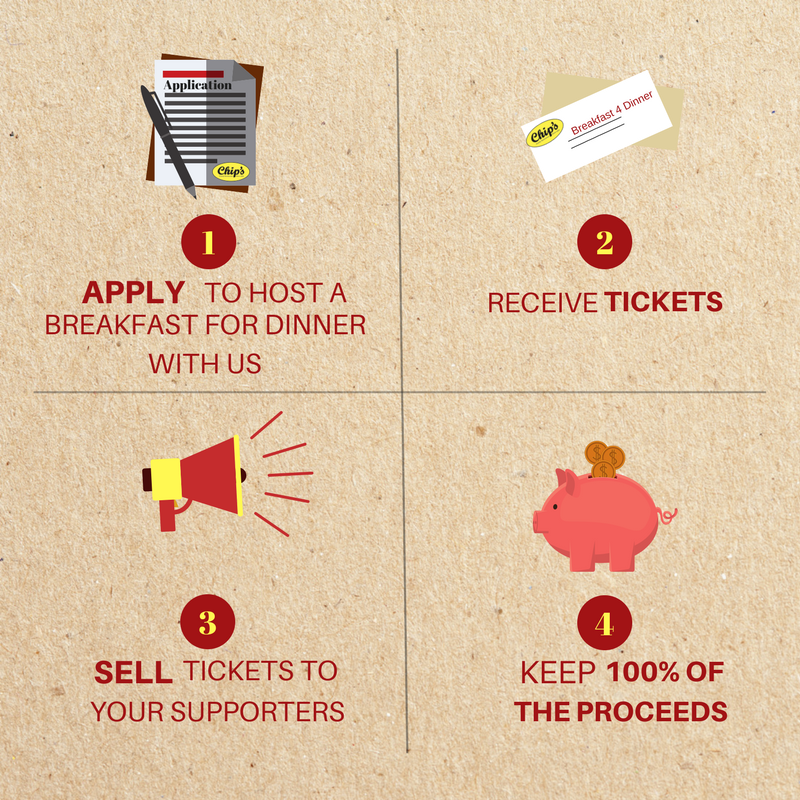 When you have a fundraiser with us, 100% of the ticket sales go back to your organization. If approved our Marketing Coordinator will contact you to review details and schedule a date and time. We will also provide you with a flyer to distribute and ticket file for you to print and sell. I understand this is only a request and does not guarantee my fundraiser will be approved. I will not promote the fundraiser until official flyers have been received with an approval email from Chip’s. I also understand that fundraisers are limited to one fundraiser every 12 months per organization. Multiple location applications will be denied.